Bracken in Caherdaniel, Co Kerry sleeps 8 people. 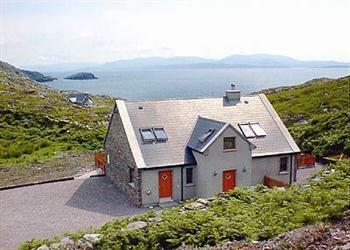 This attractive, stone-faced, detached holiday cottage in an elevated site has been designed to give panoramic views of the sea and mountains from the large, airy living areas and enclosed patio, and overlooks Kenmare Bay to the Beara Peninsula. It is just a mile from a sandy beach. At Derrynane you will find golden sands, coves, rock pools and 16th century abbey ruins. Visit Derrynane House and Gardens, with its tropical plants which thrive in this mild climate, warmed by the Gulf Stream. The property is located on the Lambs Head Peninsula, and Caherdaniel is 2½ miles, with two pubs and a restaurant. Situated 2 miles from the Ring of Kerry, an ideal touring base with wind surfing, surfing, body boarding and canoeing. There is sea fishing locally, lake fishing and golf at Waterville, 9 miles. Shop 2¼ miles. Ground floor: Living/dining room with wooden/slate floor and French doors. Kitchen area with slate floor. Utility room. Double (5ft) bedroom with wooden floor, en-suite shower room and toilet. Separate toilet. First floor: 3 bedrooms with wooden floors: 1 double (5ft) with en-suite shower and toilet, 2 twin, 1 with en-suite shower room and toilet. Bathroom with toilet. Open fire in living room (fuel available locally). Oil central heating and electric by meter reading. Bed linen and towels included. Cot. High-chair. Satellite TV. Video. DVD. CD. Double oven. Microwave. Washing machine. Tumble dryer. Dish washer. Fridge/Freezer. Large enclosed patio with furniture. Barbeque. Parking. Easy walking access. NB: Step to entrance. Holidays at Bracken run from Saturday to Saturday. Do you want to holiday near Bracken (YYK), you can see other cottages within 25 miles of Bracken; have a look to find your perfect holiday location.